Holiday World & Splashin' Safari (previously known as Santa Claus Land) is a family owned and operated combination theme park and water park, located near Interstate 64 and U.S. 231 in Santa Claus, Indiana, USA. 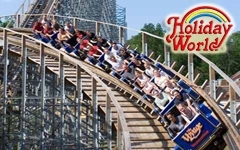 Holiday World is known for its three wooden roller coasters: The Raven, The Legend, and The Voyage. The safari-themed water park includes the world's two longest water coasters: Wildebeest and Mammoth, numerous family raft slides and water slides, two wave pools, two lazy rivers, two family "tipping bucket" water-play attractions, plus dedicated children's slides and play areas. Holiday World & Splashin' Safari offers guests free unlimited soft drinks, free parking, free use of inner tubes and life jackets, free sunscreen, and free Wi-Fi hotspots. Splashin' Safari, the water park Holiday World added in 1993, has been consistently ranked as one of the best water parks in the world by Amusement Today magazine. The water park takes the general theme of a safari, with ride names featuring various animals, rivers, and Swahili words. Entry to Splashin' Safari is included with admission to Holiday World.